In 1971, the Supreme Court decided that courts shouldn’t investigate the motivations of officials who closed public pools rather than integrate them. 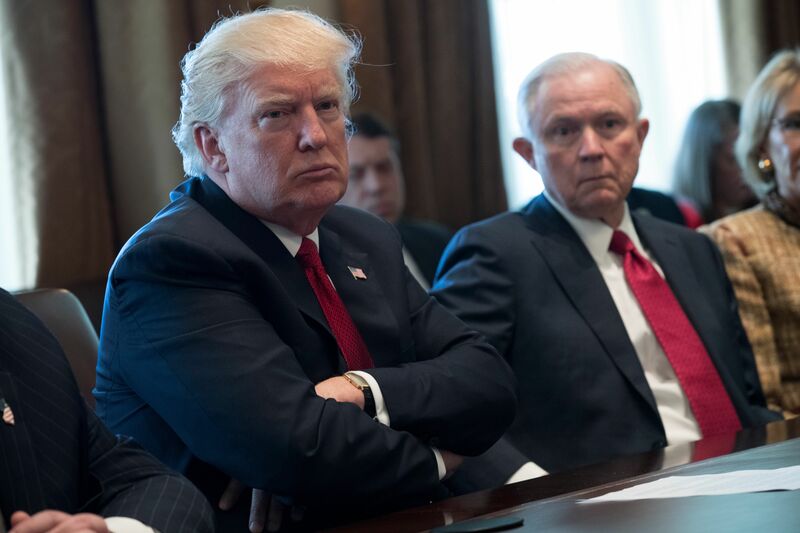 President Donald Trump and Attorney General Jeff Sessions at a White House discussion on March 29. Sessions’ Justice Department has cited a ruling in a swimming pool closure case in its defense of the travel ban. WASHINGTON ― In a brief defending its ban on citizens from six Muslim-majority countries, President Donald Trump’s Justice Department approvingly cited a segregation-era Supreme Court decision that allowed Jackson, Mississippi, to close public pools rather than integrate them. In the early 1960s, courts ordered Jackson to desegregate its public parks, which included five swimming pools. Instead, the city decided to close the pools. Black residents of Jackson sued. But in 1971, the Supreme Court, in a 5-4 decision, decided that closing the pools rather than integrating them was just fine. The dissents, even at the time, were furious. “May a State in order to avoid integration of the races abolish all of its public schools?” Justice William O. Douglas asked in his dissent. The ruling in Palmer v. Thompson didn’t explicitly uphold segregation. But it did call for courts to avoid investigating the constitutionality of officials’ motivations. But in some cases, such as the closure of the Jackson pools, officials’ motivations are clear, said Paul Brest, the director of Stanford University’s Law and Policy Lab. Palmer is one of the worst Supreme Court decisions ever handed down in regards to race, said Michele Goodwin, the chancellor’s professor of law at the University of California, Irvine. “Citing Palmer is like citing Buck v. Bell for a premise of equal protection,” Goodwin says. (Buck v. Bell legalized eugenics.) She added that a case like Palmer also doesn’t hold up over time. Justice Department lawyers know exactly what they’re doing ― citing different doctrines in an attempt to thwart any reason to examine what Trump on the campaign trail “said, very unambiguously, was to ban Muslims from coming into the country,” he told HuffPost. 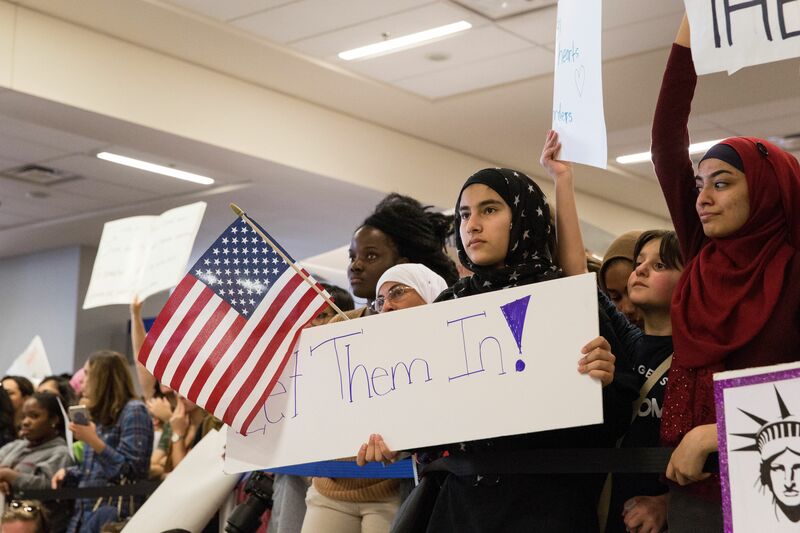 President Donald Trump’s executive order on travel from Muslim-majority nations draws protests at Dallas/Fort Worth International Airport on Jan. 29. On the campaign trail, Trump often spoke of a ban on Muslims entering the U.S. But there’s a clear reason why the Trump administration doesn’t want the courts to consider potential motivations for Trump’s revised travel ban: The idea that the president’s intent was to discriminate against Muslims has come up in prior rulings against his executive order. As a candidate, Trump called for a “complete shutdown” of Muslims entering the U.S. and has spoken disparagingly of refugees. He and the White House say the travel executive orders are not the same as a Muslim ban, but opponents say his past statements show they likely had the same motivation. The executive order blocks certain foreign nationals of six Muslim-majority nations ― Iran, Libya, Somalia, Sudan, Syria and Yemen ― from the U.S. for 90 days. (An earlier executive order had included Iraq.) It also bans all refugees for 120 days and cuts total refugee resettlement numbers for the year by more than half of the previous cap. The order was blocked in the courts before implementation. Pools have a history as a racial flashpoint. In the 1960s, “so unacceptable through almost all of the South was the idea of blacks and whites swimming together that even the Gulf of Mexico was off-limits to blacks in some areas,” The New York Times reported in 2006. White racial anxiety about swimming was common in the North, too. “Water fueled white racism,” Marta Gutman, a professor at the City College of New York, wrote in a 2008 paper. Elise Foley and Ryan Reilly contributed reporting. This entry was posted in Executive Order, foreign policy, GOP, immigration/deportation, Travel Ban, Trump. Bookmark the permalink.